What’s not to love about our tasty, healthy little hemp seeds? These nutty seeds are a great source of energy and are packed full of protein. Delicious and versatile, our organic shelled seeds can be eaten anytime of the day. Organic shelled hemp seeds (also known as hulled hemp hearts) have a delicious nutty texture that’s instantly nourishing. Want to increase your iron and fibre intake? Plant-based hemp seed recipes are an excellent and succulent way to supplement vegan diets and active lifestyles. It couldn’t be easier to enjoy hemp seeds throughout the day, at home and on-the-go. Tender and nutty, they can be consumed raw, or lightly toasted. We love adding hulled hemp seeds to our Sensi mango smoothie so that it’s extra filling and creamy. They also make a great addition to banana bread, pesto, hummus, and muesli, or sprinkled over salads, yogurts, or whatever you like. So simple and delicious. Gluten-free, easy to digest and full of fibre, hemp seeds are the perfect choice for any sensitive diet. They can be eaten by those intolerant to nuts, gluten, lactose or sugar. Our organic hemp seeds are 100% natural and completely unprocessed once the shell has been removed (which then transforms them into hulled or shelled seeds). 30g per day contains the recommended daily amount of essential fatty acids. That's just 2 tablespoons, packed full of nutrients and protein. Hemp Seeds are a gift of nature and fully live up to their superfood status. They are the most nutritious seed in the world. Containing a potent balance of proteins, essential fats, vitamins and enzymes that help create optimum health and well-being. The whole body benefits from eating hemp seed recipes regularly. Superfood Plant Protein: It’s been said that the protein content in hemp seed is comparable to that of beef, lamb or quinoa. 30 grams can provide about 11 grams of protein, nearly 25% of its total calories. Treats Skin Disorders: The vitamin E contained in hemp seeds help reduce inflammation and dryness, which is great for soothing skin conditions such as eczema, psoriasis and other rashes. Balances hormones: Studies have shown that gamma-linolenic acid (GLA) is useful in helping to balance hormones. For women, GLA can ease premenstrual syndrome and reduce pain during menstruation. Healthy heart: It’s no surprise that essential fatty acids also promote a healthier heart. GLA can lower bad cholesterol and prevent saturated fat build-up in the arteries. Crucial for the nervous system too. Eases Arthritis pain: The immune modulating effects of essential fatty acids combined with the anti-inflammatory effects of vitamin E and Omega 3, may help improve the symptoms of arthritis. All Sensi Seeds Hemp Foods products are completely additive-free and natural. Our premium-quality organic products have been tested and are EKO certified. So give your body a boost and buy hemp seed food now! 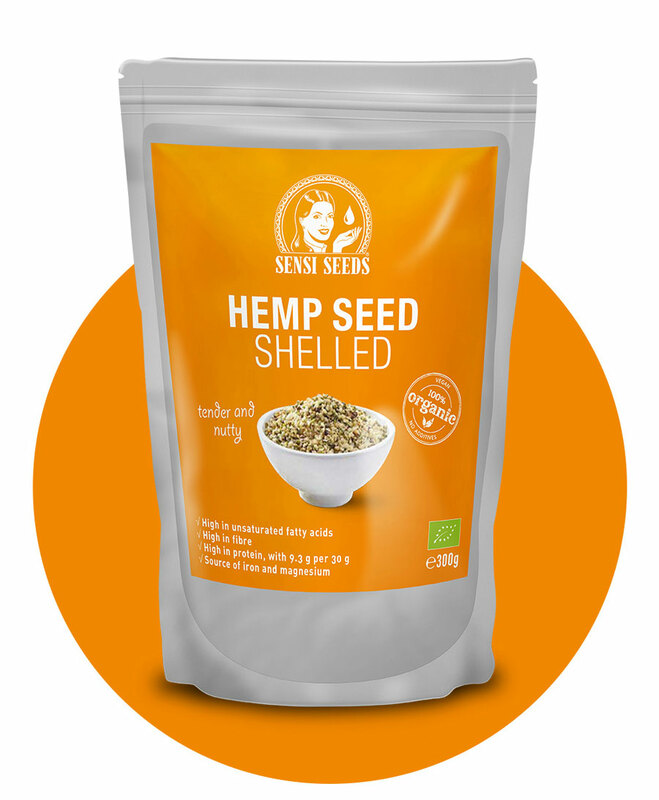 Organic Hemp Seed Shelled (300G) is added to your shoppingcart! Organic Hemp Seed Shelled (300G) is added to your wishlist!